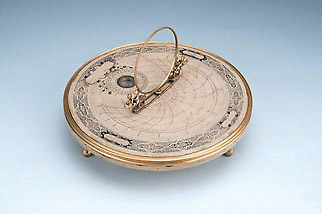 This unusual azimuth dial has its hour lines incised on a circular tablet of stone. The decorative gnomon is a ring which can be both slid against, and rotated about, a central pivot. In use the gnomon would be first adjusted by sliding it so that its pointers indicated either the date or the sun's position in the zodiac. The ring would then be rotated to the direction of the sun when the southern pointer would indicate the time. The instrument, which is constructed for latitude 49? 30', has no indication of maker or date, but the reverse side of the table has lengthy instructions in German.